For the first warm days of spring we decided to make the Italian classic – spaghetti and meatballs! Of course, everything (including fresh pasta) is made from scratch and cooked outside. The ingredients that we used are homemade too. 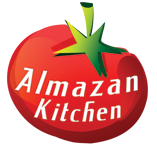 Enjoy this simple yet amazing recipe of a most traditional Italian dish with a note of AlmazanKitchen hand! Do not hesitate to try it out! Recipe is below! Add 1 cup of flour. Form a ball, cover with something and let it rest. Take 500g of beef mince and flatten it out. Do not forget to cover the cutting board with oil to prevent meat from sticking to it. Spice up the mince with salt and smoked paprika. Preheat your pan. Oil it up. Cook the meat balls until ready. Slice 2 organic onions then toss it into the pan. Fry the onions for a few minutes. Unpeel, smash and chop few garlic cloves, toss into the pan after. Add ½ cup of homemade ale. Mix and slow cook for a minute. Add 1 cup of homemade tomato sauce. Slow cook for 10-30 min on a low heat until it gets rich consistency suitable for you. Finish off with 1 tbsp. of dried oregano. Toss in the meatballs and slow cook until meatballs soaked good in sauce. Take out the dough, make a spaghetti using special hand machine. Boil the water and cook the spaghetti about 5-8 min. 2 min until it’s “ready” start checking the process to catch the state exactly according to your taste. Put the meatballs with sauce on spaghetti. Finish off with 100g of grated provola cheese and handful of fresh chopped parsley. As a man with Sicilian blood, I can say I would absolutely love to try this version of the classic dish! Looks amazing as always!